In May it was Milliband, Clegg and Cameron at the Cenotaph for VE day (see previous blog). Six months later, how things change – and stay the same. Who are those two frowning in the background? Why, none other than T.Blair and whatwashisname, oh yes, J.Major, Former PMs. 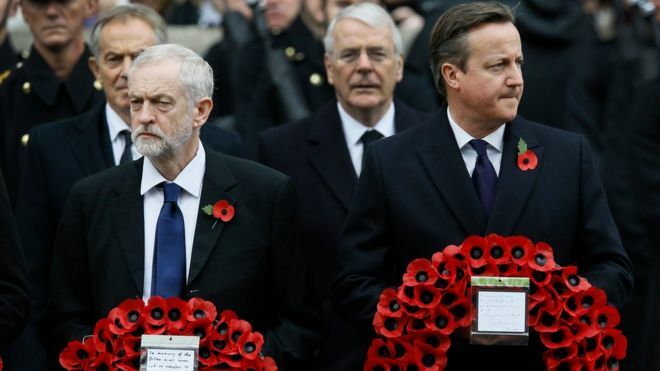 And looking the other way, our very own J.Corbyn and `Dave’ Cameron. This entry was posted in Uncategorized on November 9, 2015 by Carole Woddis.